Strait Street is fast becoming a hub of social life and creative activity in Valletta while restoration and regeneration works are underway. This was the vision of the Valletta 2018 Foundation from the outset. 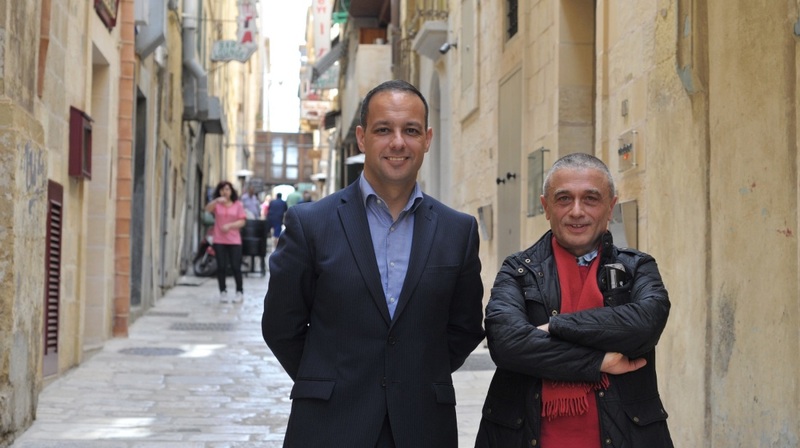 The Valletta 2018 Foundation announced the appointment of Dr Giuseppe Schembri Bonaci, a Valletta-born arts academic, to oversee Strait Street’s long-term sustainability while it is being transformed into a permanent hub of activity. Addressing a press conference, Valletta 2018 Foundation Chairman Jason Micallef said “Strait Street is fast becoming a hub of social life and creative activity in Valletta while restoration and regeneration works are underway”. This was the vision of the Valletta 2018 Foundation from the outset when it was announced that Strait Street will be turned into a buzzing zone of social activity and entertainment. In direct coordination with the Valletta 2018 Foundation, Dr Schembri Bonaci is overseeing the organisation of cultural and artistic activities linked with Strait Street as well as the bridging of events. This includes activity which will be taking place at the Valletta Design Cluster, to be established at the area known as il-Biċċerija, in 2018 and beyond. In discussion with the Valletta Rehabilitation Project – responsible for restoration and regeneration works – Dr Schembri Bonaci is contributing knowledge and direction on the street’s aesthetics while helping interpret history with a focus on the contemporary. In Dr Schembri Bonaci’s words, “Strait Street is to become a tradition and institution; a brand name of art and culture. This will be sustained by a programme of quality events and continuous activity”. He thanked the Valletta 2018 Foundation for appointing him as the Artistic Director for Strait Street noting that this holistic approach for such a project is necessary in the run up to 2018 and beyond. Dr Schembri Bonaci will be supervising the coordination between all venues, bars and restaurants and street hubs while creating links with all interested potential partners including the University of Malta, MCAST, the School of Art, the School of Music, museums, Teatru Manoel (and other theatres), the Malta Philharmonic Orchestra and root/popular culture sectors including new bands and għannejja, among others. Activites will include exhibitions, theatre productions, seminars, symposia, talks, street theatre, night events, jamming sessions, direct meetings and networking sessions with artists. The regeneration of jazz music, cabaret, theatre and urban culture is among the programme’s objectives, which will see the participation of international artists on a regular basis. The rehabilitation of Strait Street as an activity centre; architectural restoration reflecting its character and history; the re-establishment of entertainment and urban culture life; and the rehabilitation and conservation of historic wall paintings and signs, is among the work that will be carried out. Giuseppe Schembri Bonaci graduated in Arts, Philosophy and in Law. He has been active in the Malta art scene for these last forty years. Senior lecturer at the History of Art Department (University of Malta). He studied and graduated from the University of Malta, the State University of Moscow, the State University of Kiev and from the State University of Milano. Exhibited his works in France, Italy, Russia, Germany, Australia, Spain and other. He was also founder and director of ‘Teatru Strada Stretta’. Studied and worked in Theatre in Moscow, Milano and Paris. In Moscow he studied theatre direction under the Vachtangov director Piotr Fomenko whereas in Milano under Dario Fo and Franca Rame. At the University of Malta he lectures in Modern and Contemporary Art. Schembri Bonaci is also the MA (Fine Arts) coordinator. He was also the first Chargé d’Affaires (on Ambassadorial level) for Malta in Moscow for more than seven years. He has published innumerable studies on art and other and is a regular contributor to Sunday papers. His publications include critical analyses of major Maltese artists such as Emvin Cremona, Antoine Camilleri, Willie Apap, Josef Kalleya and others. He is the Artistic Director of the Mdina Biennale 2015/16, [the Mdina Cathedral Contemporary Art Biennale] and the artistic coordinator for the Valletta University Campus.